Shoulder arthritis is a debilitating condition. It generally affects those who are middle aged, between 50-60yo and usually has a definable cause, unlike arthritis of the hip and knee. The most common causes are avascular necrosis (AVN), trauma (i.e. fractures and tendon ruptures), instability, post surgical (i.e. from foreign bodies in the shoulder) or due to a distinct cause: cuff tear arthropathy (see below). In general, when the arthritis is primary (i.e. no definable cause), then all the soft tissue structures are intact, such as the biceps tendon and the rotator cuff tendons. When it is secondary, it can exhibit injury to these soft tissue structures depending on the cause. 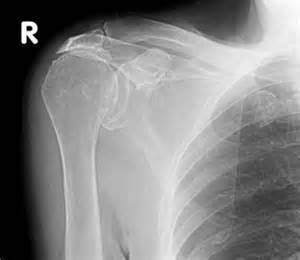 Shoulder arthritis also has different wear patterns depending on the cause. In primary arthritis, the glenoid (the socket part of the ball and socket joint) is retroverted. Retroversion is when the bone is worn away more on one side than the other and makes the glenoid point backwards. This can sometimes be a major issue, especially when arthritis has been going on for some time, as it can lead to a significant loss of bone, making it much more difficult to insert a shoulder replacement. There are special techniques which can overcome this issue. Symptomatically, those with shoulder arthritis have a very painful range of movement, in all directions. This is distinct from other shoulder pathologies where some shoulder movements are spared, whilst others are severely affected. There may be noises in the shoulder when moving the arm, as the bones grind on each other. Usually there is a major limitation in one particular movement: external rotation. There can be other conditions that mimic shoulder arthritis. This includes infection of the shoulder joint. Usually infections occur suddenly, and usually have a cause such as a blood borne bacterial infection from dental surgery, or a wound on the limb. 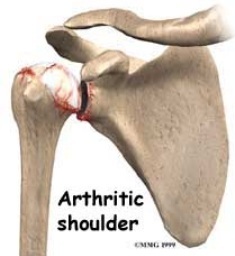 Shoulder arthritis develops slowly over many months to years. Frozen shoulder (adhesive capsulitis) is a condition where the shoulder stiffens. It is a self limiting condition and the joint surfaces are usually not affected. 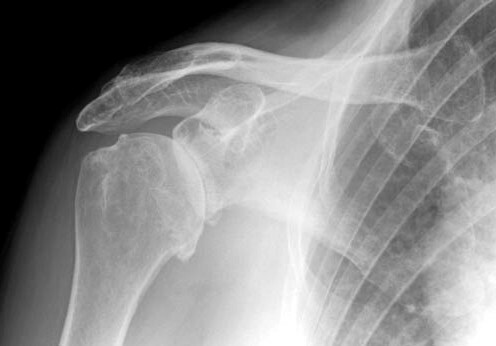 On Xray, the shoulder will exhibit specific signs that aid in the diagnosis. The first is joint space narrowing, when the cartilage is lost. There can be a specific osteophyte (bony spur) that grows at the inferior aspect of the humeral head. This is sometimes referred to as the Goats Beard. When the arthritis is due to rotator cuff attenuation from any cause, there are even more characteristic signs. The Xray on the right shows an example. The space above the joint (subacromial space) is obliterated. This space is usually where the tendon of the supraspinatus, as well as the subacromial bursa lie. When the tendon is gone for a long time, the humeral head migrates there and starts burring away at the acromion, often thinning it. Surgery for shoulder arthritis should be tailored for each patient. There are specific considerations to be made when choosing what the best type of shoulder surgery will be. Prosthesis choice is also important as it can allow modularity, meaning that if one fails sometime down the track, it can be changed to a different type with relative ease. Dr Chien-Wen Liew performs shoulder replacements both conventional and reverse through a deltopectoral approach. This is a muscle splitting and inter nervous plane, where muscles and nerves are respected. For more information, please contact Dr Chien-Wen Liew on (08) 7099 0188.